Although most contemporary photographers inkjet print their work, a smaller (but growing) number print their images by historical or “alternative” means. These are the processes developed in the early 19th century– albumen, Van Dyke, Kallitype, salted paper and others; easily 100 different processes. Each offers the photographer an opportunity to create something truly unique. In an age of digital perfection, “alt-process” prints are one-of-a-kind works of art, which is why their popularity is growing. Most historical processes follow a common workflow. First, a sheet of paper is coated with a light-sensitive material. When it’s dry, a full-size negative is placed on top and the resulting sandwich is exposed to sunlight. After several minutes, the negative is removed and the paper–now containing a latent image–is processed, washed, and line-dried. While that sounds simple, it’s also unpredictable, which is what makes each print unique. Small differences in chemistry, timing, humidity, temperature, and more determine what the finished product looks like. What worked Friday may not work Monday. A student, attempting to learn a process, will make many a bad print before he or she gains any mastery. This can get expensive, a big part of which is the cost of paper on which the print is made. A good paper is heavy (at least 80lb. or 300 gsm), has excellent wet strength and minimal curl when dry, and is acid-free (archival). Most important, it must print well, a subjective but critical requirement. Bale Grist Mill in St. Helena, California. Learn more about how this print was made below. These requirements usually dictate a cotton ragmat paper which is not specifically coated for inkjet. There are many choices on the market, but they are not cheap. It’s painful to throw out bad “learning” prints at $2 or more per try. Was there an nearly-as-good-as-rag-but-cheaper paper that my Alt-Process Workshop students could use? This summer, our search for such a paper led to the discovery that Red River’s 88lb. Polar Matte Magna favorably answers the question– with a surprise twist. When we tried sensitizing the front/up side –the normal ink-jet side– the coating beaded up and didn’t soak in very well. If we kept trying, though, we managed to get a good coat, which in turn printed quite well. Best of all, it handled washing as well as a ragmat paper. An email to Red River’s customer service for more information led to trying the back side for printing, which is easier to coat but prints as well as front-side coating. This was the paper we’d been looking for! I subsequently tried lighter weight 16×20 60lb. Polar Matte, which prints as well as the 88lb. version. However, being a lighter paper, it tended to curl when drying if not constrained (using the heat of a dry-mount press to flatten the print after it dries solves that difficulty). This paper provides a means for students to learn how to make a large print at more-affordable cost. Above is a first attempt by a workshop student using the Van Dyke process, a variant of the Argentotype process invented by Sir John Herschel in 1841. 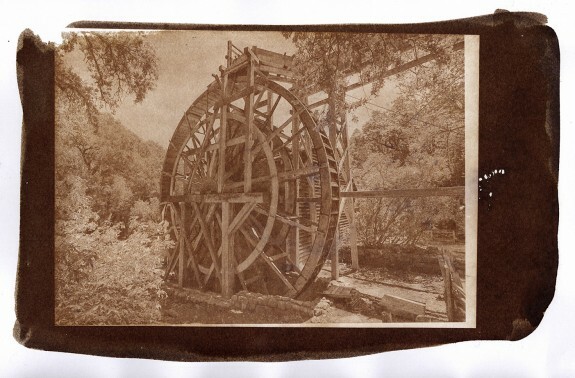 The image is of the giant waterwheel at Bale Grist Mill in St. Helena, California which was built in 1846. It was shot using a 5×7 film negative from a view camera and is printed on the back side of an 11×14 sheet of 88lb. Polar Matte Magna. You can see how crisp and beautiful the process prints on that paper. The border around the image is excess sensitizer, which turns brown when exposed to UV light. Since you can’t see what’s been sensitized when you go to print (the sensitizer applies green and dries clear), you need to coat a larger area than the negative. Once the sensitizer is dry you must try and position the negative in the middle. You can see that the student didn’t quite get the negative perfectly placed. There is a bit of raw paper showing in the top left. I’m still buying ragmat for fine-art museum-quality gallery prints, but Red River Paper inkjet media is now my go-to paper for alt-process classes and farmer’s market prints. It’s a great product at a great price! And we can also use it for inkjet prints! Do you make Alternative Process prints? What’s your favorite process? Share your experiences with other readers in the Comments section below. This is interesting. During the early 1900’s, my grandfather made contact prints on blue print paper and what appears to be “plain” paper. I understand the blue print paper process. What he used for the “plain” paper process has always been a mystery. This article gives me a clue to what he was doing. I enjoy checking the different Red River paper articles and links. Thanks for the info.